October 3, 2016  The charismatic conductor first heard Stravinsky's rambunctious music when he was just 8. Watch him lead the Simón Bolívar Symphony Orchestra of Venezuela live on Thursday night. May 13, 2013  Pink Martini singer Storm Large joins Leonard Slatkin and the orchestra for Kurt Weill's satirical Seven Deadly Sins, in a program bookended by composers who straddled the turn of the last century. 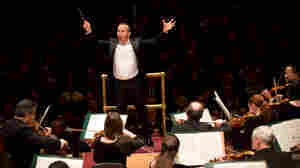 January 17, 2013  Led by new music director Yannick Nézet-Séguin, the the Philadelphia Orchestra shows off in virtuoso works by Ravel and Shostakovich, as well as a rarely heard concerto with an exceptional violinist. December 18, 2009  When classical musicians literally play to their own strengths, magic can happen. Hear today's top classical musicians revisit the music they know and love best in recordings chosen by Boston's WGBH. November 6, 2009  Ravel's piano suite Le Tombeau de Couperin harkens back to old music and old friends. Pianist Christopher O'Riley renews his love for the piece, which captivated him as a young conservatory student. Watch him perform the opening "Prelude." November 5, 2008  From the International Institute for Young Musicians in Lawrence, Kan., it's an all piano program featuring kids from ages 12 to 16, playing Ravel, Rachmaninoff, Scriabin and Chopin. August 21, 2008  Maurice Ravel's "Le Tombeau de Couperin"
July 23, 2008  Fleisher celebrates his 80th birthday Wednesday. Critic Tim Page chooses some of the pianist's finest recordings, highlighting Fleisher's remarkable career of triumph, loss, and rejuvenation. January 7, 2009  This week, from San Francisco's Herbst Theatre, a 12-year-old pianist confronts a tricky Hungarian Rhapsody, a teen string quartet plays music by Ravel, and a virtuoso clarinetist from Costa Rica confesses his nostalgia for soccer and salsa dancing. February 25, 2008  The New York Philharmonic will perform Tuesday at the East Pyongyang Grand Theatre in Pyongyang, North Korea. The concert represents an historic occasion, as a prominent U.S. cultural institution visits an isolated nation. February 9, 2007  The French pianist brings to the Disney Stage his nuanced and atmospheric interpretations of his countryman Maurice Ravel, one of the main figures in the musical impressionist movement. Thibaudet also puts his unique pianistic stamp on works by Robert Schumann. Stephen Hough plays "Alborada del Gracioso"
October 10, 2006  In concert in Oregon at Portland Piano International, Stephen Hough plays Maurice Ravel's "Alborada del Gracioso." August 31, 2006  Maurice Ravel had a habit of rearranging his music from piano to orchestra and back. In that spirit, Michael Stern leads a student orchestra in the finale to "The Fairy Garden"; Viviane Loriaut plays "Laideronnette, Empress of the Pagodas"; and the Paratore Brothers play "Pavane of the Sleeping Beauty" and "Hop-o-My Thumb." July 27, 2006  The grand champions of duo-piano, Martha Argerich and Nelson Freire play an encore from their concert at the Grand Theatre in Quebec: Ravel's "Laideronette — Empress of the Pagodas." Then, Angela Cheng plays Ondine from Ravel's Gaspard de la Nuit. 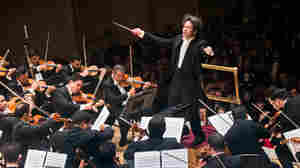 July 21, 2006  Fred Child, host of NPR's Performance Today, hosts an exclusive webcast from Festival del Sole, featuring pianist Piotr Anderszewski and violinist Nikolaj Znaider, with Stephane Deneve conducting the Russian National Orchestra. May 31, 2006  Gary Graffman, president of the Curtis Institute of Music in Philadelphia, says goodbye Wednesday after 20 years as director of the influential music school. From Graffman's farewell concert, we'll hear him solo in the Concerto for Piano Left Hand by Maurice Ravel. Christoph Eschenbach leads the Curtis Symphony Orchestra. August 19, 2004  NPR's Fred Child is on stage at the Bishop's School in La Jolla, Calif., for SummerFest 2004. 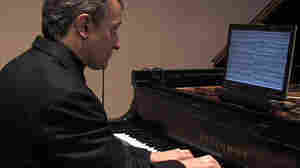 He talks with pianist Andre-Michel Schub, who plays music by Chopin and Ravel. Schub is joined by SummerFest Artistic Director Cho-Liang (Jimmy) Lin on violin. August 12, 2004  The eclectic Canadian chamber ensemble performs and discusses its innovative music. The group has been playing a wide-ranging repertoire of everything from sonatas to tangos for over 10 years.